Truck Thursday or Teutonic Thursday? Few things look cooler on an old splitty bus than vintage logos and a dose of patina. I sprayed the body of this m2 vw with matte lacquer, then went to town on it. I had tried to make it looked like it had been primed over the logos and sanded back. It didn’t work but the thin layer of grey gave the paint a chalky faded look. The roof too was luck. I did a full roof of rust, but it looked like too much. While thinking about what to do i worked on another part and accidentally got mineral spirits on the roof. 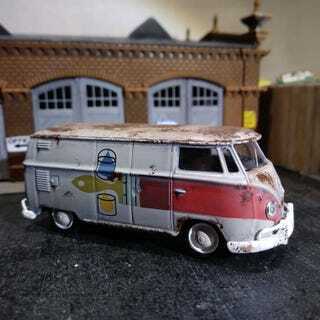 Dabbing it up got me the random blotchy rust on the roof that looks super realistic. I have suddenly gotten on a patina M2 kick. I finished another on tonight’s Twitch stream and have two more that just got their matte clearcoating.